Striped Bass Eat Too Much – Ya Like Dags? Ah, the majestic striped bass. It’s been called the “perfect fish” by enthusiastic anglers, and represents one of the greatest successes of fisheries management in North America. It fights like a demon when hooked and is delicious when baked. Anglers are so enthusiastic about them that they will turn on commercial fishermen at the slightest evidence that a handful of stripers are getting caught in their gear, and this fish has considerable political clout thanks to the massive amounts of money brought in by the recreational fishing industry. Other popular sportfish like bluefish and false albacore are mere peons compared to them. In North Carolina, only red drum are mentioned with the same reverence and sought with the same obsession. All hail Morone saxatilis, the mighty striped bass! Everyone's favorite fish. Image from Florida Fish and Wildlife. It’s not that I don’t like striped bass. Stripers are a fun fish to catch and taste great, and are one of the better excuses to call out sick and get on the water. I just get tired of hearing about them on a near-constant basis. North Carolina is a state with many interesting and worthwhile fish to catch, but sometimes it seems like the entire state’s recreational fishing culture lives and dies solely on these black and white brutes, and this is reflected in the amount of research and management effort that goes into them. So I’m here to tell you that striped bass are not all that. In fact, they eat way too much. Spiny dogfish, blamed for single-handedly keeping every valuable fish stock in the Atlantic down, are density-dependent feeders, which means that their diet typically reflects whatever is abundant in the local environment. As foraging strategies go, this could be considered one of the more “responsible”, as it prevents dogfish from over-consuming any one species and also allows them to switch prey when necessary. According to results from a compilation of diet studies on striped bass (Walter et al. 2003), striped bass contrast with dogfish in that they are actually fairly selective. In the Chesapeake Bay and North Carolina, stripers feed almost exclusively on schooling forage fishes, in particular menhaden (also a favorite of the spiny dogfish) and alosines (river herrings). Unlike dogfish, stripers are anadromous, which means they can pursue their prey into fresh water as they make their annual spawning runs. This is reflected in the seasonal nature of river herring in the diet of striped bass, while menhaden are a fairly constant presence and are likely the most important food source while the bass are out in the ocean. 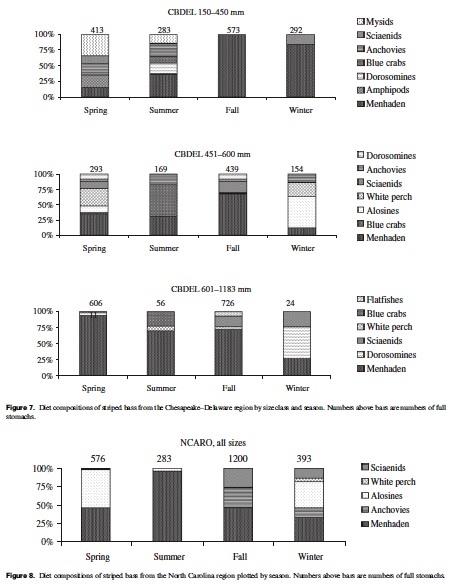 Percent diet composition of striped bass by size class in Chesapeake and Delaware Bays (CBDEL) and all sizes in North Carolina (NCARO). From Walter et al. (2003). Menhaden in particular shoulder a lot of the responsibility for feeding striped bass, and river herrings have to put their time in during the winter and spring. This has the potential to create some issues, particularly given that river herring have been in trouble for some time, and are a conservation and management concern in their own right. Essentially we have a high-level predator that has dramatically increased in abundance largely thanks to its popularity as a sportfish, and it’s feeding primarily on forage species that a.) are also important in the diets of plenty of other predators, and b.) are crashing. Uphoff (2003) reports that in the upper Chesapeake Bay during the years 1997-2000, the striped bass population became severely ill, resulting in lowered stock fitness and fecundity. The reason? Not enough menhaden to eat. Stripers in the upper Chesapeake had actually hit their carrying capacity and there was simply not enough food to go around. This paper shows a direct correlation between efforts to produce the biggest stock of massive, trophy-sized striped bass possible and a crash of the comparatively-neglected menhaden. Hartman (2003) paints an even bleaker picture in the Hudson River, where predation by stripers on river herring may be outpacing the ability of alewife and blueback herring to replace their numbers. Turns out that while the resurgence of striped bass was great news for recreational anglers, it could not have come at a worse time for river herring. It seems that the heavy favoritism towards striped bass may be at the expense of their prey species and, in the long term, the whole ecosystem that supports them. What to actually do about this situation presents a thorny problem: it’s almost impossible to overestimate the popularity of striped bass, and recreational anglers and states that benefit from recreational fishing have a considerable vested interest in maintaining large stocks of massive, hungry stripers. Do we double our efforts to conserve forage species (even though the sheer appetite of their predators might make this a futile gesture)? Do we take steps to increase the population of striped bass predators (perhaps a job for the spiny dogfish)? Do we increase fishing pressure on striped bass (which would probably be deeply unpopular among anglers, not to mention that fishing to purposely reduce population is a slippery slope)? I’d love to see peoples’ thoughts on this. Striped bass. What gluttonous pigs. Nice article. I think the issue here with striped bass screams at the necessity of ecosystem-based management. Although I have skepticism as to whether or not EBM can actually be successfully implemented, it is clear that only managing single species with little regard to their ecology is not the best way to go about things. EBM certainly makes the most biological sense however, understand that fisheries management is not designed to manage fish. The truth that we oft seem to overlook is that rules and regulations relative to all matters “fishy” are designed to control the human influence on a fishery. These are people control issues more than they are “fishery” issues. approach to regulations pertinent to all fishery issues we will forever be guided by wrong-headed thinking. Would Omega Protein still be allowed to be (over?) harvesting the economically many times more valuable “lowly” menhaden if we were looking at the bigger picture of how to best serve and control all the people involved with and effected by this ecologically sensitive fish? I think not. Of course, “we” are permitting so many menhaden to be harvested because of Omega Protein’s financial ability to purchase political favors and thereby protect their monopoly to exploit a public resource that correctly belongs to all the people. The sad truth is that the ecosystem including the welfare of striped bass and the economy would be far better served by eliminating this menhaden reduction fishery and instead, let them live to clean the water and feed the bass! It would be more accurate to state, Omega Protein. What gluttonous pigs.! Good points Dean and Sherry. The drops in abundance of menhaden and river herring have a lot to do with overfishing and bycatch, and overconsumption by striped bass is a drop in the bucket compared to those problems. That said, predation needs to be considered in the recovery plans for those forage species, and we’ve definitely created an imbalance in the ecosystem by favoring striped bass while continuing to overharvest menhaden and wreck the watersheds that herring depend on. While I totally understand what you’re saying (and this is a great article), I now can’t get the image of a “fish with considerable political clout” out of my head. Remember super-lobbyist Jack Abramoff? I’m now thinking of an amberJack with Abramoff’s face. I have a hard time thinking of Sheldon Whitehouse without briefly imagining a clam running for president. Which, coming from Rhode Island, would make actually make a lot of sense. Well, there’s still a big wooden cod hanging in the Massachusetts State House. Of course, that fish’s political influence didn’t keep it from being scrod. You’d be amazed how much of an influence cod still have on just about every fisheries management decision made up in New England, especially in Massachusetts. Pretty impressive for a fish that no longer makes up the majority of the landings. A glance at Omega Protein’s financial reports shows a decline in financial health of that company that parallels the decline in the menhaden population. It is ironic that if Omega ceased harvesting menhaden, they might become more profitable long term by harvesting the increased predator populations that would result from menhaden’s increased abundance. When Omega Protein isn’t fishing for menhaden they move on to the mackeral. River herring mix with sea herring in the ocean and the pair trawlers in the New England herring fleet leave very little behind. Forage fish are obviously crucial to all fisheries, but to blame striped bass for the lack of forage fish is certainly a stretch at best. Up here when the pair trawlers aren’t allowed inshore there is an abundance of bait, but when they come in it is amazing how quickly the forage fish disappear. Prior to the appearance of the pair trawlers the stripers and the forage fish seem to co-exist quite nicely, along with the tuna and bluefish who also have been known to enjoy a meal as well.